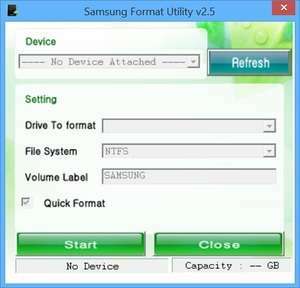 Samsung Format Utility is a small tool which can quickly format the contents of Samsung external hard drives. By formatting drives with Samsung Format Utility, you will completely erase the contents of the drive. You can select between two different filesystems: FAT32 and NTFS. It's important to note that FAT32 drives are normally on suitable when using very old hardware with an outdated operating system. For security reasons, you should also check out the Samsung Format Utility download at LO4D.com which includes virus and malware tests. Additional screenshots of this application download may be available, too. Samsung Format Utility download been highly rated by our users.